Most of superconductors in a magnetic ﬁeld are penetrated by a lattice of quantized ﬂux vortices. In the presence of a transport current causing the vortices to cross sample edges, emission of electromagnetic waves is expected due to the continuity of tangential components of the ﬁelds at the surface. Yet, such a radiation has not been observed so far due to low radiated power levels and lacking coherence in the vortex motion. Here, we clearly evidence the emission of electromagnetic waves from vortices crossing the layers of a superconductor/insulator Mo/Si superlattice. The emission spectra consist of narrow harmonically related peaks which can be ﬁnely tuned in the GHz range by the dc bias current and, coarsely, by the in-plane magnetic ﬁeld value. 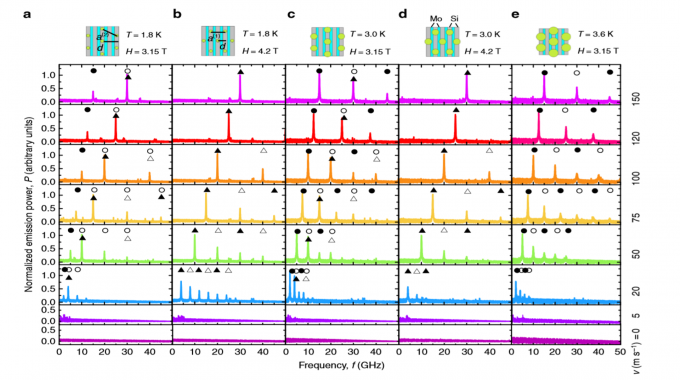 Our ﬁndings show that superconductor/ insulator superlattices can act as dc-tunable microwave generators bridging the frequency gap between conventional radiofrequency oscillators and (sub-)terahertz generators relying upon the Josephson effect.